The internationally recognized chef Heston Blumenthal is best known for his English cuisine and his trademark dish–snail porridge. Raymond Blanc, the famous Michelin Star recipient, is perhaps best known for his dish of courgette flowers stuffed with crab mousse. A signature dish is perhaps the best way to represent the distinctive character and values of a restaurant. An especially unique dish is a great way to get people talking about your restaurant positively. This article is not a treatise on how to cook or what to cook in your restaurant; as the chef, these things are up to you. The goal of this article is to provide an overview of the basic values and variables in the culinary process to enable you to steer your cooking skills towards that great trademark recipe. The signature dish doesn’t necessarily have to be a main course. There are many famous signature dishes designed to complement main courses. Think about what your strong point is when it comes to cooking. Is there one dish in particular that showcases your skills as a chef? Are you able to take mushrooms to places mushrooms have never been? An easy way to pinpoint a hit dish is to determine which dish earns you the most compliments. No, this does not mean to focus on putting only carrots, beets and potatoes in your dish. 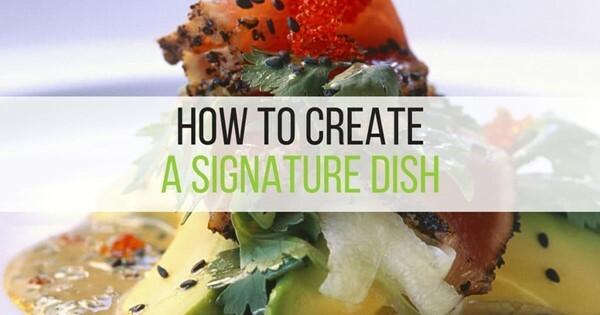 You should try to connect the dish to you or your restaurant in some tangible manner. Try to make the dish evoke the history and culture of the restaurant through the flavours. Rich textures, flavours and aromas can be used to add mystique to the dish and to popularity. Everything else on the menu may have nothing to do with the story your signature dish tells, but they are still on the menu. If you have a wonderful signature dish that is wonderfully out of place, the effect will be similar to trying to play Justin Bieber to Celine Dion fans. It’s important to remember that diners have certain expectations when they attend a restaurant. If your restaurant specializes in Mexican cuisine, don’t derail your patrons by offering them a unique, delicious and out-of-place Greek dish. Don’t be afraid of trying out unusual combinations of ingredients. Combining two ingredients that don’t typically go together in a tasty dish can be a great way to get your dish in the news. Michelin star quality is probably your dream for your dish. This is a great goal to shoot for, but focus on making your dish top-notch at your restaurant first. Train your wait staff to tell the story behind the dish and to advise customers what best accompanies it. Have your dish discussed on the restaurant’s social media sites and in press releases. 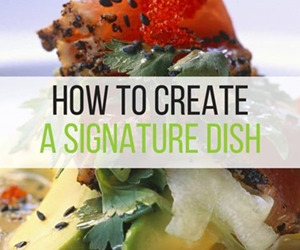 Easy steps such as these are great ways to get your signature dish out in the open and to drum up business.